From bonnets to brooches to bags - a few lovely bunny-themed wearables to continue my series of 'Easter Treats'. If only the cape and bonnet came in grown up sizes, but there's nothing stopping me from wearing the brooch and the bag, once it's in stock. All the details of where to buy are listed beneath the image. a. 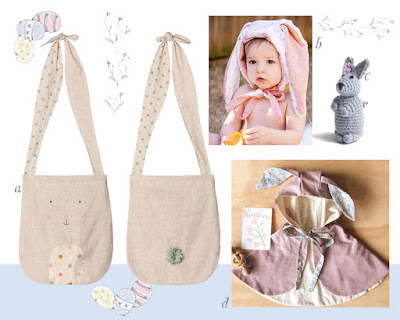 Due in from Maileg this May, the lovely bunny bag will be around £45. I'll be stocking it at Cottontails and placed my order nice and early so it should be with me as soon as it hits the UK distributor. c. Fair trade bunny brooch ticks all the right boxes - handmade, fair trade, lovely and suitable for grouwn-ups too. I stock it at Cottontails, it's £9.50 and available here. d. Beautiful bunny cape is part of an amazing collection by a designer I discovered on Instagram. Visit Lupine and Luna for more details.